Celebrate your favourite sport with our unique collection of dimensional interlocking puzzles. Our handcrafted wooden jigsaws are a lasting and memorable gift for any sports enthusiast or puzzle connoisseur. Each detailed puzzle is mounted on a display base and is made from lacquer finished Chinese rosewood. A delightful display in any room. Solutions included. Rugby Ball contains 15 pieces and measures 15cm x 12cm x 10cm. Celebrate your favourite sport with our unique collection of dimensional interlocking puzzles. 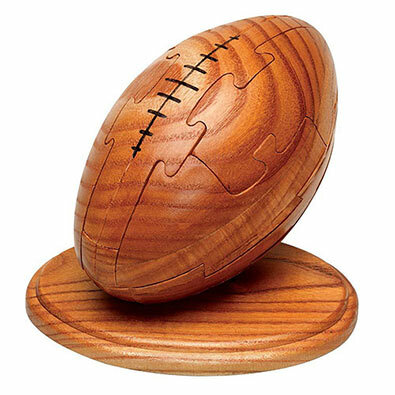 Our handcrafted wooden jigsaws are a lasting and memorable gift for any sports enthusiast or puzzle connoisseur. Each detailed puzzle is mounted on a display base and is made from lacquer finished Chinese rosewood. A delightful display in any room. Solutions included. Football, contains 15 pieces and measures 10cm in diameter. Celebrate your favourite sport with our unique collection of dimensional interlocking puzzles. Our handcrafted wooden jigsaws are a lasting and memorable gift for any sports enthusiast or puzzle connoisseur. Each detailed puzzle is mounted on a display base and is made from lacquer finished Chinese rosewood. A delightful display in any room. Solutions included. Golf Ball contains 12 pieces and measures 8cm in diameter.